This Baked Spaghetti recipe is for mini loaves of creamy Alfredo baked spaghetti topped with meatballs and marinara sauce. It’s a Tucci Benucch copycat recipe! There is a restaurant at the Mall of America called Tucci Benucch that I went to with my husband a few months ago. The food was delicious! As usual, I had a hard time deciding but finally chose the Chicken Parmesan and Brian got Four Cheese Ravioli. One of the other items I wanted to order was their Famous Baked Spaghetti. I haven’t made it back to the restaurant to try it so I decided to make it at home. Most baked spaghetti recipes that I’ve seen use a red sauce but the baked spaghetti from Tucci Benucch is made with a white sauce. The red sauce is added after baking, so that is how I made mine. I decided to use my mini loaf pan instead of baking the spaghetti in a large pan. This is the pan I used when making this recipe. It is a Wilton Perfect Results, 8 cavity loaf pan. Here is my affiliate link (I will receive a small commission if you purchase through this link). First mix about 6 cups of cooked thin spaghetti with Alfredo sauce. I made my own sauce, but you can use the jarred sauce if you prefer. After greasing the pan, fill each of the mini loaves with the pasta and press down on the top to pack in it, adding more as necessary. Sprinkle the tops with shredded mozzarella cheese. While the spaghetti is baking, heat Italian meatballs and marinara sauce. 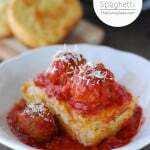 Put a little sauce in a bowl, add one of the baked spaghetti loaves, top with Italian meatballs and more marinara sauce. Sprinkle with freshly grated Parmesan and oregano. Serve with garlic, cheese bread, and a green salad. Preheat oven to 350 degrees and grease mini loaf pan. Mix cooked spaghetti with Alfredo sauce. 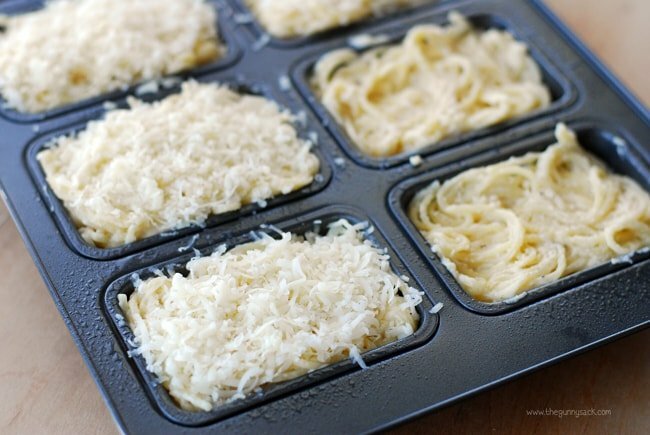 Fill each of the mini loaves with the pasta and press down on the top to pack in it, adding more as necessary. Sprinkle the tops with about 2 tablespoons shredded mozzarella cheese. 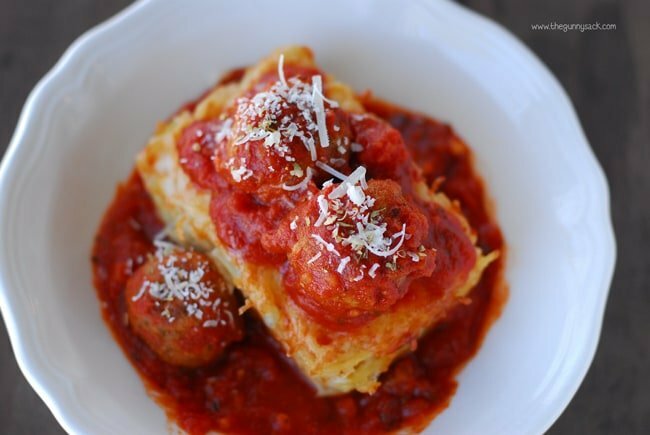 Put a little sauce in each bowl, add one of the baked spaghetti loaves, top with Italian meatballs and more marinara sauce. Optional: Sprinkle with freshly grated Parmesan and oregano. Bring heavy cream, minced garlic, pepper and salt to a boil over medium heat. Add butter and cream cheese, stir until smooth Heat until it starts to boil. Using a whisk (or a fork), stir in freshly shredded Parmesan, one cup at time, until smooth. 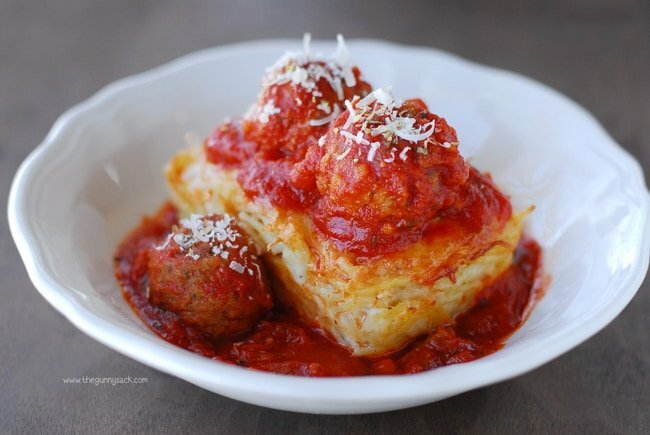 By far our favorite Baked Spaghetti recipe. So much so that it is on the menu at our Pasta Bar Graduation Party this weekend for my second daughter!! Thank you for sharing it. I made this for dinner tonight and even made the Alfredo sauce. I did cut the recipe in half and made it in an 8×8 dish. It was so good. Easy and yummy! Thanks for the recipe. I have made baked spaghetti before and it was so hard. I made this last night. It was amazing. I used a Low Fat alfredo recipe by Our Best Bites & everyone loved it. I made this tonight and it was delicious…for those of you using alfredo from a jar , it takes one 16 oz jar of it to 12 oz of thin or angle hair spaghetti… I used a mini pan with 9 slots in it and had extra left over so I used a cupcake pan with 6 holes in it…we had plenty…and it was so so good…. Do you have to make it and put it right in the oven or can it be made ahead of time? If you can how long will it hold and do you refrigerate it. I would like to bring it over to a sick friend. What a wonderful friend you are! Yes, this can be made ahead of time. Cover and store in the fridge, for up to two days, until ready to bake. It might take a little longer to bake since the spaghetti will be chilled. It could also be stored in the freezer and thawed before baking. It is great to make ahead. I did this, but you might want to change the ratio of pasta to sauce. The pasta soaks up the sauce a little, so it might be less creamy. I made it and second day it was a bit dry. But with the spaghetti sauce, it was still really good. I will definitely make again, and make ahead. I could probably use a muffin/ cupcake tin, right? About how much pasta is 6 cups? A pound? Has anyone made this is a larger pan instead of mini-loaves? If so, how long did you bake it? I am feeding a large group of kids this weekend in a hotel suite w/kitchen. Trying to take as little of my kitchen with me as possible. I always make this in a large pan. I bake it at the same temp and time. do you have the nutritional facts for the baked spaghetti recipe? Would love to be able to calculate. I made this for dinner tonight! Seriously one of the best recipes I’ve pinned on Pinterest. My family loved it and the homemade Alfredo sauce was to die for. Thank you for the great recipe. Yayyyy!! I’m so happy to hear that! I’ve made these twice. Once with store bought alfredo and the other time with homemade alfredo. Homemade recipe was way better!! So good!! 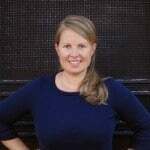 Question – do you have nutritional information for one loaf? That is wonderful to hear! Yes, homemade alfredo wins every time! Sorry, I do not have that information. 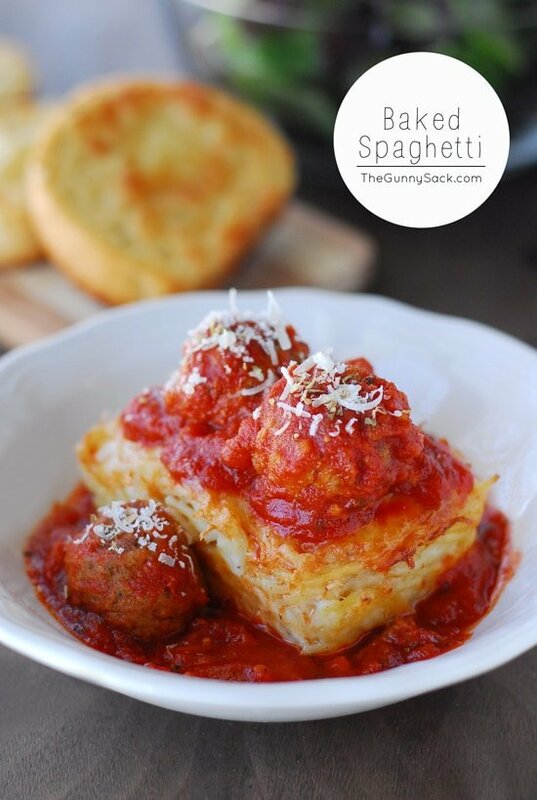 Made this tonight…I made my own meatballs and spaghetti…super easy and my family loved it!! I just made this and it is amazing!!!! I used store bought alfredo and marinara sauce. I also used half of the noodles required and replaced that with spaghetti squash—So good!! 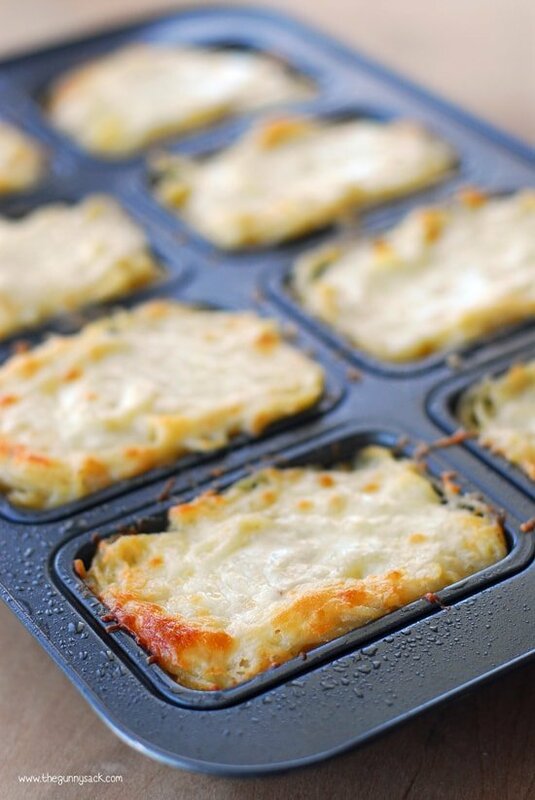 Do you think these would freeze well after cooking the pasta in the mini loaf? Looking for meals to prep ahead of the birth of my second daughter. Was wondering where you bought your mini loaf pan? Thank you for asking! I updated the post to include the pan I used. It is a Wilton Perfect Results 8 Cavity Loaf Pan. Do you think it would work with other pasta shapes? I have a mixture of leftover pasta I want to use up and this looks fabulous! How can I print this recipe without wasting ink and paper on comments and ads? I would love to try these recipes but don’t have the time to write them down. If you scroll down to the bottom of the blog post, the full recipe is in a box outlined with dotted lines. Underneath the image within that box is a button that says “Print”. Click on that button and a new window will open with just the recipe. Go to the menu bar on your browser window and choose “Print” from the drop down menu under “File”. Or you can select the recipe with your mouse, right click and choose “copy”. Then, open a blank page in a Word document, right click again and choose “paste”. 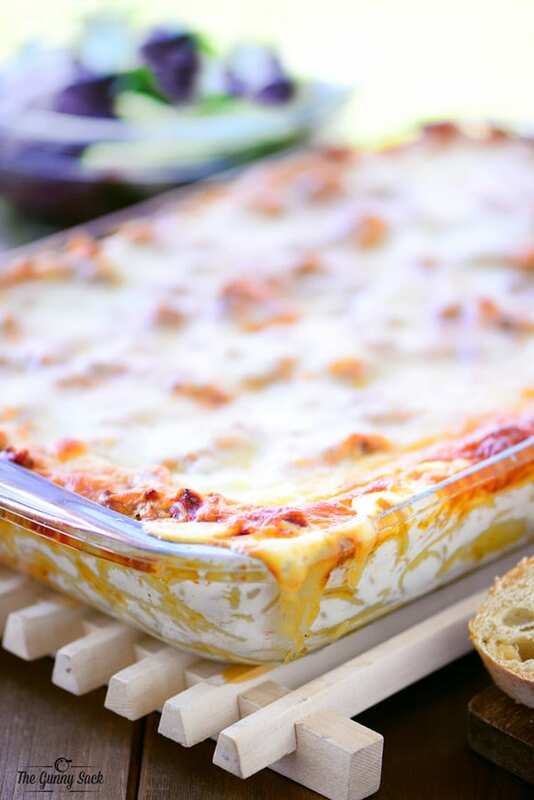 Hands down, this is the BEST baked spaghetti recipe! You pretty much nailed the Tucci Benucch copy-cat. Since I am lactose intolerant, I used lactose free half and half, lactose free cream cheese, and dairy free margarine. I omitted the mozz cheese, although I could have substituted with Rice Shreds. My very picky daughter, who really doesn’t care for spaghetti and sauce, said this was “killer” and gave a thumbs up! Yay!!! That makes me so happy to hear! Thanks for stopping back to let me know. these sound fabulous but real Alfredo sauce breaks when you reheat it. I have always made fresh Alfredo and have not found a way to stop it yet. 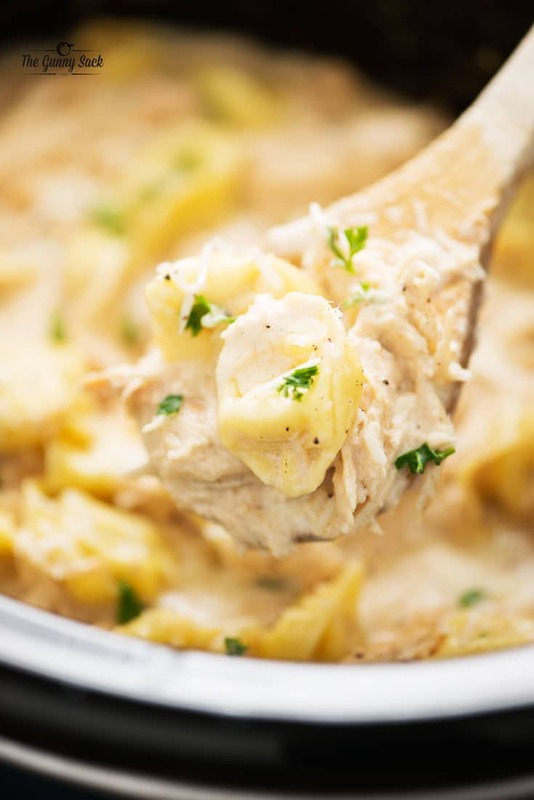 I use an Olive Garden copy cat recipe for Alfredo Sauce that calls for 2 OZ cream cheese. Never had it to break. Perhaps that’s how they keep theirs from breaking. It wouldn’t do for a restaurant to have to keep making fresh. Try adding a little cream cheese to your recipe. 2 oz. should do it. So thank you for adding another amazing recipe to our menu! That is my boyfriends absolute favorite dish/restaurant. It is a 5 hour drive so we don’t go often. After the first time he had it, he raved about it for the next year and a half. I finally took him again for his birthday in November 2014, and he got it again, so I tried it this time and OMG AMAZING. We went the next day for lunch, and I got it too! Worth every penny. I’m making my own version of it tonight, i’m sure it won’t be the same, but hoping it still tastes good! Have you tried to freeze the baked spaghetti?